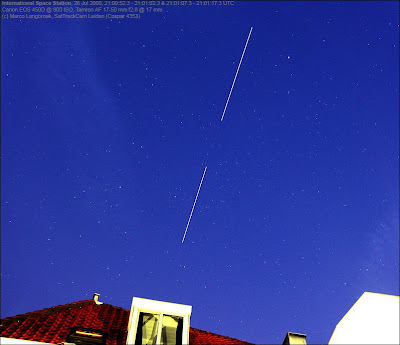 The International Space Station (ISS) made a nice zenith pass in a dark blue evening twilight sky this evening. I came back home from a diner with friends just in time to capture it. The image below is a stack (digital sum) of two separate images of 10 second exposure each, taken with a 5 second interval between them. It was the inauguration of a new lens that was added to my equipment today: a Tamron Di II SP AF 17-50mm F/2.8 XR LD Aspherical (IF). The image was taken at 17mm. Camera: Canon EOS 450D at 800 ISO. There was some cirrus in the sky. The bright star just right of the trail is Vega.